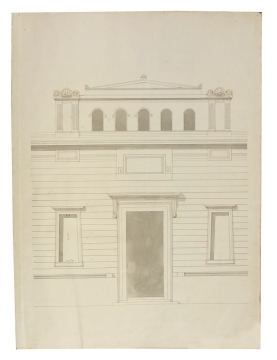 Drawings 3 and 4 show variant designs for the attic over the entrance on Princes Street. In both designs, an arcade of semicircular-headed arches spans between twin pilasters supporting scrolled acroteria. The tympanum of each acroterion encloses a scallop shell. Drawing 3 shows an extra set of blind semicircular-headed arches, which have been cancelled in pencil. 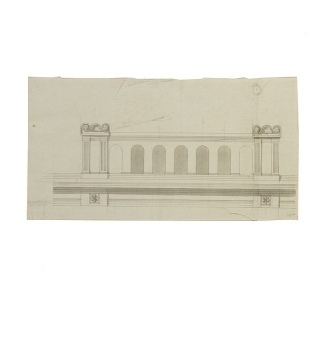 Drawing 4 includes a pediment crowning the attic and incised moulding framing the arches.